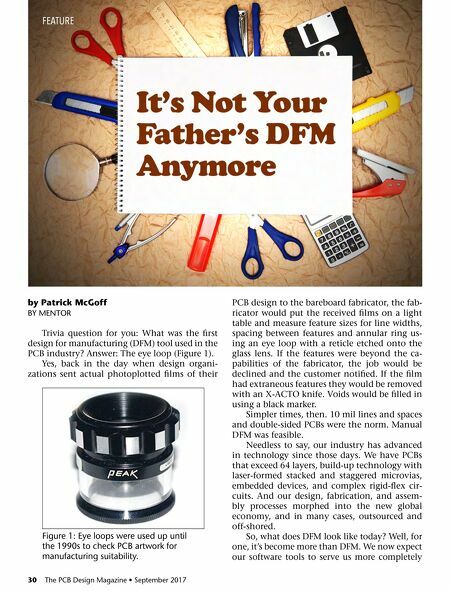 30 The PCB Design Magazine • September 2017 by Patrick McGoff BY MENTOR Trivia question for you: What was the first design for manufacturing (DFM) tool used in the PCB industry? Answer: The eye loop (Figure 1). Yes, back in the day when design organi- zations sent actual photoplotted films of their PCB design to the bareboard fabricator, the fab- ricator would put the received films on a light table and measure feature sizes for line widths, spacing between features and annular ring us- ing an eye loop with a reticle etched onto the glass lens. If the features were beyond the ca- pabilities of the fabricator, the job would be declined and the customer notified. If the film had extraneous features they would be removed with an X-ACTO knife. Voids would be filled in using a black marker. Simpler times, then. 10 mil lines and spaces and double-sided PCBs were the norm. Manual DFM was feasible. Needless to say, our industry has advanced in technology since those days. 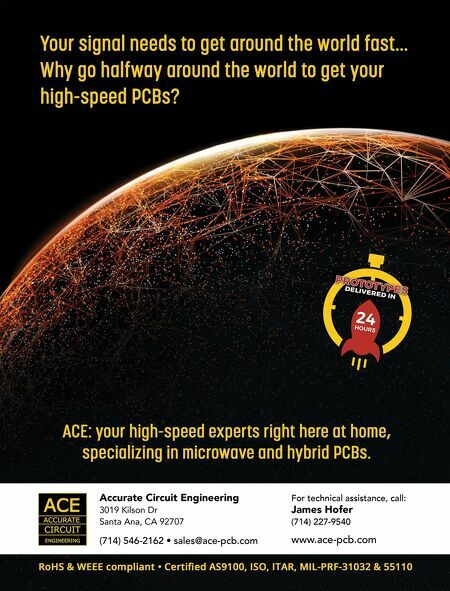 We have PCBs that exceed 64 layers, build-up technology with laser-formed stacked and staggered microvias, embedded devices, and complex rigid-flex cir- cuits. And our design, fabrication, and assem- bly processes morphed into the new global economy, and in many cases, outsourced and off-shored. So, what does DFM look like today? Well, for one, it's become more than DFM. We now expect our software tools to serve us more completely FEATURE Figure 1: Eye loops were used up until the 1990s to check PCB artwork for manufacturing suitability.